Resides in a school district of more than 15,000 square miles and migrates a distance of 20 miles or more to a temporary residence to engage in a fishing activity. (This provision currently applies only to Alaska). 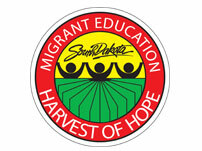 If you and your family move from one school district to another to work in farming or agriculture, your child might be eligible for the migrant education program. To find out if your child is eligible, or to contact the local migrant education program for services, call from any place in the country. If you have questions, please contact Jenifer Palmer, (605) 773-4437, or the Title Office at the South Dakota Department of Education at 605-773-6400.